The latest blogtotal is is £16,930, thank you so much, I am blown away by the generosity of you all. 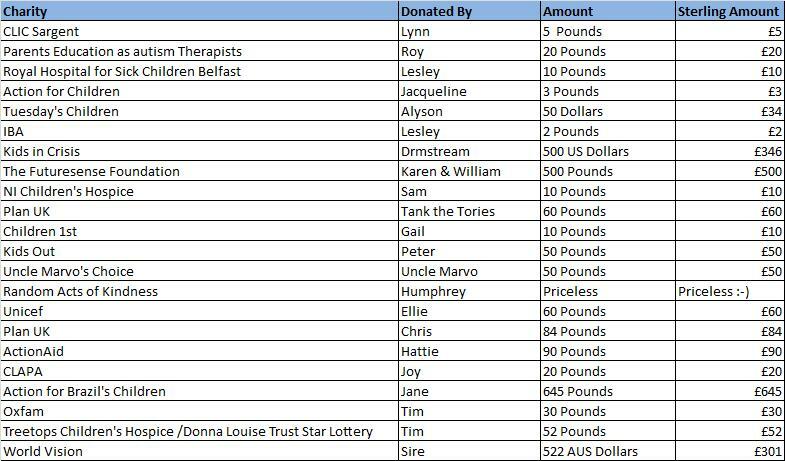 I refresh this page to show only the latest donations but please check out the links to all the charities below so that you can read about the organisations that have been talked about on the blog to date. ingThe latest donation is from Vicki who donated £50 to the Project Trust who work to place Gap Year Students; specialising in sending 17-19 year old school leavers overses for 8 or 12 month volunteer placements in Africa, Asia or the Americas. Their main philosophy is to provide young people with an opportunity to understand a community overseas by immersing themselves in it; living and working there for a year. All projects are vetted for their suitability for volunteers, and none deprive local people of work. I think this is a great idea. Many talk about ‘the youth of today’ in such derogatory terms. Most of the young people I know love to have fun but they are also supportive and kind to friends and family. This organisation allows young people from the UK to experience a life they wouldn’t normally see whilst helping others at the same time. A fine thing to broaden your life experience before taking that into your future studies and/or career. Our next donation is from Henry. He responded to my post on Nightmares and has donated $20 to the Unicef Syrian Children’s Fund. We have Unicef as a link on the blogroll below from previous donations. However, I want you to see what they are specifically doing to assist the children in Syria. The civilian population of Syria is is a living and dying hell with no control over what will happen today or tomorrow. The Unicef Press Centre issued a statement on September 6th. I think it is worth reading; it tells you of their efforts for the refugee situation with regards to malnutrition and disease screening and vaccinations – http://www.unicef.org/media/media_65742.html. Please do read; we can’t understand the issues unless we have the information. My thanks to Henry for reading and donating. Then we have a donation from Karen from Cape Cod. Karen has made a $25 donation to the Jimmy Fund. The Jimmy Fund was set up when the Variety Club of New England and the Boston Braves baseball team joined forces to help a 12-year-old cancer patient dubbed “Jimmy.” On a national radio broadcast, millions heard the boy visit with his heroes from the Braves as they stood by his hospital bed. Contributions poured in from people everywhere, launching an effort that continues to bring hope to thousands of children and adults facing cancer throughout the world. Many teams have a history of working with specific charities and this is a great example, not just helping children with cancer but working on research to make their work more effective. I would love you to read the Story of Jimmy, an inspiring example of how the experience of one child has made such a difference to so many. Our next donation is from Gay, who donates to the Mill River Wetland Committee. This non-profit organisation combines education and the protection of endangered wetlands, isn’t that a great idea:) They took their concern for our environmental future to launch River-Lab, a hands-on program of environmental study for grades 3-6 in all public schools in Fairfield. They consult with educators and environmental experts, providing classroom materials and activities for students, extensive training for study-trip guides, and professional development for teachers. Their classroom training is enhanced by study-trips to the Mill River and town estuaries. Each year, more than 160 volunteers guide over 3,500 children through more than 650 study-trips. Education and conservation in one brilliant package. Unfortunately Gay didn’t mention a specific amount for her donation so I have added in $20 which I think is a reasonable amount to include. I would love you to visit the Comments Page to see Gay’s video too. Lastly, the blogroll has grown so much that I have to split it into three images so that you can see them properly; I never imagined I would have so many to list, it makes me smile. I will be updating the totals again at the weekend and will be delighted to add this in and update those numbers yet again. You have made me smile on a very grey old day…. As promised here is some information on a recent walk I took part in for NSPCC. I came across the e-mail inviting people to take part by accident and thought it looked like a real challenge. The invite was to join a 20 mile HACK (Hike Against Curelty to Children) across the Mourne Mountains. You could sign up as an individual or a team. I gathered a few friends and we did the walk as a team of 4. I trained for many weeks leading up to the walk as I knew that I would need a decent level of fitness for it. During this time we all e-mailed friends, family and work colleagues for sponsorship for our team. We got an amazing response which really spurred us on to do well on the day. The day itself was extremelly challenging, mostly because of the ground conditions from the bad weather the day before. I don’t think anything could have prepared us for how long it would take because we kept sliding in the mud and losing our boots in muddy puddles. But the scenery, the company, and the overall atmosphere was amazing and there was no way our team was not going to complete those 20 miles! We eventually hobbled through the finish line after about 9 hours of walking. The £1200+ that we raised made every step worthwhile. You have also made my day, another £1200 to add to the blogtotals when I update them this weekend. This will break the £16,000 barrier and that is very special to me. My thanks to you and the rest of your team, awesome work!! My son donates £4 of his pocket money every month to the SSPCA. He watched an advert for it last year, and at the end, the tears ran down his face. He decided there and then to help the animals. Oh my Scottish Mum, what a lovely thing! Your son is a kind person and kind children become kind adults. You will see that this is a blog for children’s charities but your son’s donation will be added to the list. How can I not add a donation from a child? Hi Lesley – have had a chance to read your first 2 chapters – brilliant. can’t wat for the rest!! 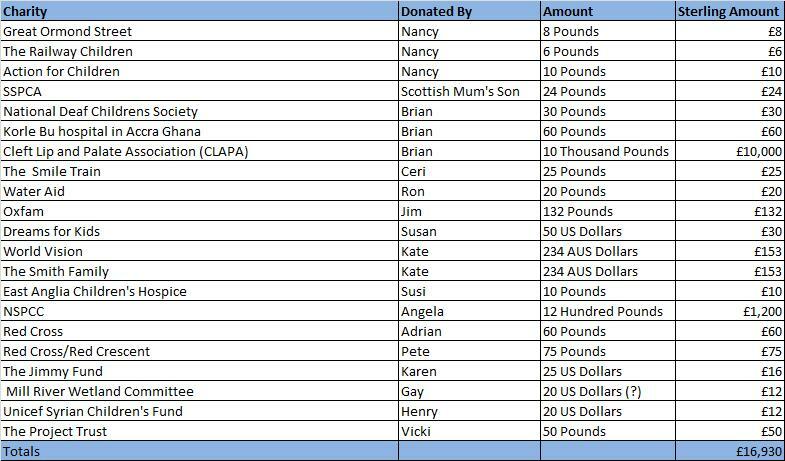 As for charities, my wife Seaneen has a monthly standing order for £19 to World Vision where she sponsors a child in an under developed country. I also do a yearly fast for Concern where the money goes to help children in mainly Africa. 2006, I raised £516, 2008 – £220, 2009 – £230 and am currently collecting for this year. Anyone wishing to sponsor me please feel free to get in contact via my e-mail or replying to this. Keep up the good work Lesley. Thanks for such a lot of donations to the blog! 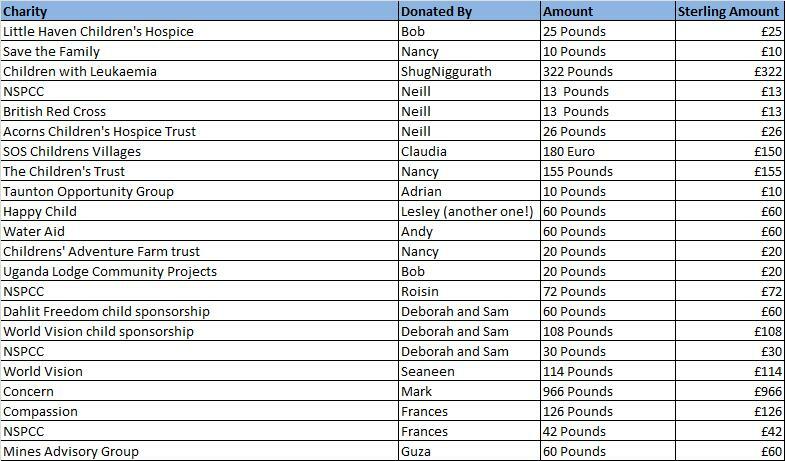 This will add considerably to the totals:) I am also delighted that we are adding a new charity to the list. Concern is a fantastic organisation and I am really looking forward to writing about them. I am so glad you liked the first 2 chapters, I will keep you posted as I do more. It is obviously something I have to do in any spare time I have and it requires a fair amount of ‘mulling’ to get my brain in gear. But I know where I am going with the next few and hope to have a couple out there in the next couple of weeks. My thanks again to you and Seaneen. when I was eight I was torn between being an actress and being a mouse breeder…. I am also chuffed with your 8 year-old ambitions. I understand the actress aim but adore the mouse breeder; I would love you to give me a little background to that as you are the fits aspiring mouse-breeder I have ever encountered…..
You are a love as always:) That is a brilliant donation to people who are braver than me for an excellent cause……. I will be updating the totals again at the weekend and will be delighted to add this to the ever-growing totals! As requested I’m just leaving a note to tell you about a small donation I have made to Taunton Opportunity Group which is a pre-school group for children with additional needs. I was inspired to do this by your blog, and by the story on the TOG website http://www.tauntonopportunitygroup.org.uk/ of Andy Heather who has climbed Mount Kilimanjaro to raise over £7000 for the group. Thank you so much for the donation and another new charity for the blogroll:) Andy Heather is a brave man for tackling such a challenge for the charity. Hi, I just found your blog tonight via Twitter (thanks for the follow by the way); I donate £15 quarterly to Oxfam, and also pay £2 a week (one annual payment of £104) for two entries into the Donna Louise Trust Star Lottery, which helps to fund the Treetops Children’s Hospice based in Stoke-on-Trent, but which covers North and Mid Staffordshire and South Cheshire (www.donnalouisetrust.org). I’ve been involved with the Trust since shortly after its inception. The basic premise was devised by the parents of a young lady named Donna Louise Hackney, who died from Cystic Fibrosis aged 14. Her parents wanted to do something that would be a lasting tribute to Donna, and out of that came the idea of a children’s hospice, as kids from Stoke previously had to travel North to Manchester or South to Walsall, which made life extremely difficult for their families. After a lot of fundraising, and with some terrific corporate support, particularly Congleton-based Gladman Homes, who built the shell of the building free of charge, the Hospice now offers a respite care service to life-limited children and their families, and a home nursing service to try and delay or prevent the need for a child to spend time in hospital. We have been badly affected by the recession, having to reduce our services to four days a week from seven, but still have some great fundraising support – particular credit must go to Nick Hancock and Stoke City Manager Tony Pulis who very literally nearly died in their attempt to climb Mount Kilimanjaro for the Trust, and to Stoke City player Rory Delap, who for the last three years has, along with his brother, completed long-distance sponsored cycle rides. We are also fortunate to get support from entertainer Jonathan Wilkes, who is a regular in The Regent Theatre’s pantomime, which donates one night’s takings to the Trust, and comedian Jo Brand, who has done two free shows for us during her national tours. Oxfam is well known for its work and we all admire their work across the globe. I always count a 6 month period with regular donations to a charity so will log £30 for Oxfam. I know that they aren’t solely a children’s charity but they help so many children that they belong here. Treetops Children’s Hospice is an example of a smaller local charity. I am delighted to see another locally based charity added to the blog. Also, thank you for adding in such detail about the fundraising efforts of Donna’s parents via Donna Louise Trust Star Lottery, Gladman Homes, Jonathan Wilkes, the wonderfully brilliant Jo Brand (love her! ), Nick Hancock, Tony Pulis and, of course, the man with the longest throw in the Premiership, Rory Delap. Did I mention that I like football? This weekly donation will add another £52 to the blogtotal, giving us £82 to add and taking the totals to a fantastic £2081 – eeeek! My hope is, of course, that anyone who reads these comments will be encouraged to add more to the coffers of your two charities. I will also write to both of them to ask if I may add them to the Charities Page so that more publicity will ensue…..
Lastly, if I may ask, please come back to the blog and tell me what you wanted to be when you were 8? I would love to know as this at the heart of this blog. Thanks for your kind comments – I figured you might be a football fan – I should declare an interest that, despite their efforts for Treetops, I’m not a Stoke fan (I’m about to enter my 34th year supporting Liverpool). I can’t really remember what I wanted to be when I was 8; but I know at some point around that time I wanted to be in the Army because I wanted to be the Brigadier in Dr Who, which I used to watch with my Dad. Somewhat – no very – emabarrasingly I also wanted to be Gary Glitter, because I thought he had a gang, and I wanted my own gang! I’m not sure what to say, both to Liverpool and Gary Glitter. As a life-long (since I was 4) Man Utd fan, I will allow your Liverpool support to stand. As long as your support is of long-standing then I can be happy for you! I can give you the Gary, didn’t we all want our own gang when we were young? I am with you on the Brigadier, I loved Doctor Who, watched from behind the sofa as a child. The Brigadier was a wonderful character that I am chuffed that he has come back in the new reincarnation over the past few years. I admit that I am even more of a fan now and love Matt Smith even though I didn’t think anyone could beat David Tennant in the role. I will add together your 2 comments on the comments page so that everyone can see your 8 year-old ambitions. I like them both, travelling butcher or bus-conductress. You may say there weren’t too ambitious but I think they showed a childish fondness for travel and I’ll bet that you love to travel now?